Place water, garlic, bay leaf and salt into a pot. Bring to boil and then add your buckwheat groats. Cover and turn down to simmer. Cook for about 15 minutes or until the groats are tender. Strain out any excess water and place on sheet pan lined with parchment paper to cool. Place all the ingredients in a blender and puree for a minute until very smooth. Then pour into an isi canister and charge with 2 isi charges. You can keep this in the refrigerator until ready to use. Place the shaved rhubarb in a heat proof container or bowl. Place the remaining ingredients into a pot and bring to boil. Then pour the hot vinegar pickle over the rhubarb. Cover and let it come to room temperature. Set aside for later. This can be done days in advance. In a bowl add salt, egg white, and a splash of water to make a consistency reminiscent of wet sand. Then encapsulate the celery root in the salt mixture completely. Place in pan and into the oven. Bake for 1 hour and 20 minutes. Then take out and let it cool for at lest 20 minutes. Break the salt shell and discard. Then peel the celery root. Take the smallest ring mold cutter and cut 1 inch rounds out of the celery root. Use the scraps for another use. Set aside the rounds for later. Place large diced beets into a food processor with 1 cup of water. Place a small piece of paper towel over the whole so nothing comes flying out. Puree until the beets are in tiny pieces. Then strain out the water completely. Place 1 cup of oil in small pot for frying. Bring the oil up to 345 degrees. Place a small bit of beets into the pot of oil to fry. Fry for 1 - 2 minutes. Then strain out on a paper towel and season with salt. Repeat until all is fried. In the same oil fry the boiled groats in small batches until they are golden brown. Strain off onto a paper towel and season with salt. The groats take on a real nutty flavor and crunch. Place 1 tbsp of butter and 1 tbsp of oil in a pan with the celery root rounds. Brown on all sides and season with salt. Take a few paper cups and spray with non stick spray. Cut 3 slits towards the bottom of the cup and one on the very bottom. Then take your aerated brioche and fill the paper cups half way. Then microwave for 30 seconds. Take it out and flip it over for 30 seconds and then remove from the cup. 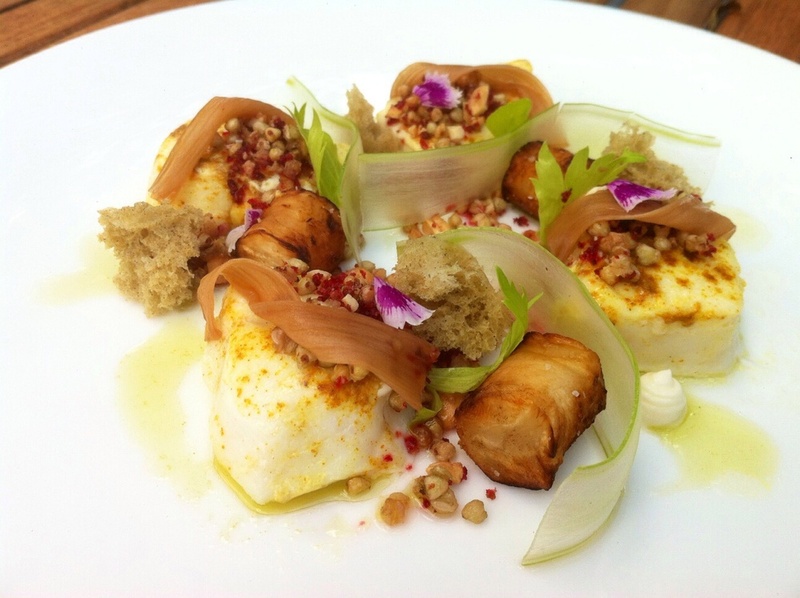 Take the sous vide halibut out of the bag. Season with salt and place in a non stick pan on medium heat just to warm up a little more on both sides. Then on your plate add a little cilantro mint sauce down. Place your halibut on top of the sauce (4 pieces). In a bowl mix fried groats, beets, and chopped bitter almonds. Spoon some of that around the plate and on top of the halibut. Add a shaved slice of rhubarb on top of that with a little pickle juice on the fish. Then add your celery root rounds. Add your iced shaved celery slices. Add a few dollops of fresh ricotta. Add your brioche, celery leaves, and little olive oil. Serve and enjoy!